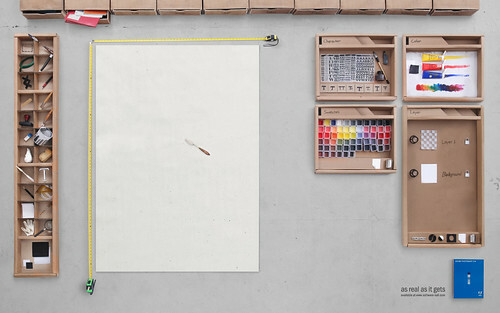 “As real as it gets” by advertising firm, Bates 141 Jakarta. A very clever representation of, I dare say, one of our design software’s most recognizable user interface. Even the tag line is great. I love it! Check out their production process and the full size (obviously photoshopped) final print image on their flickr site. I really like the design, I think it works well and I am impressed. I would like to see a bigger version so I can read the tag line. @KateC click on the link to the flickr site it has a cool full size one that looks great on a desktop too! What’s the chance of getting photoshop modification to implement this?